Choose the cruise because we wanted to see New Zealand but the cruise line Celebrity was recommended by the travel agent . Well recommended, Celebrity Solstice was perfect for us, not too big but big enough to have plenty to do and mainly adults. The ships crew from the captain down were friendly, helpful and extremely efficient. The food was excellent although the main buffet resturant, huge choice of different types of food, could get very busy and sometimes vacant seats were difficult to find. we found the main restaurants to provide a much better dining experience. Excellent food and a good selection of dishes to choose from. The waiting staff were excellent, friendly, knowledgeable and extremely polite and efficient. The ports of call were varied and interesting but the ship excursions were expensive. We booked all our through Viator on line before we left home. Roughly about half the price. The cabin was spotless and kept spotless as was the rest of the ship. Hand gel use was encouraged at all the dining rooms and on returning to the ship after shore excursions. We found the embarkation easy and straight forward, much quicker than our previous experience on another cruise line. We extended our stay by 4 days.at Sydney prior to the cruise and at Auckland after the cruise. Well worth the extra time. Loved the cruise the ship and it’s staff. 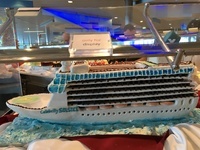 Celebrity Solstice Cake in dining room.